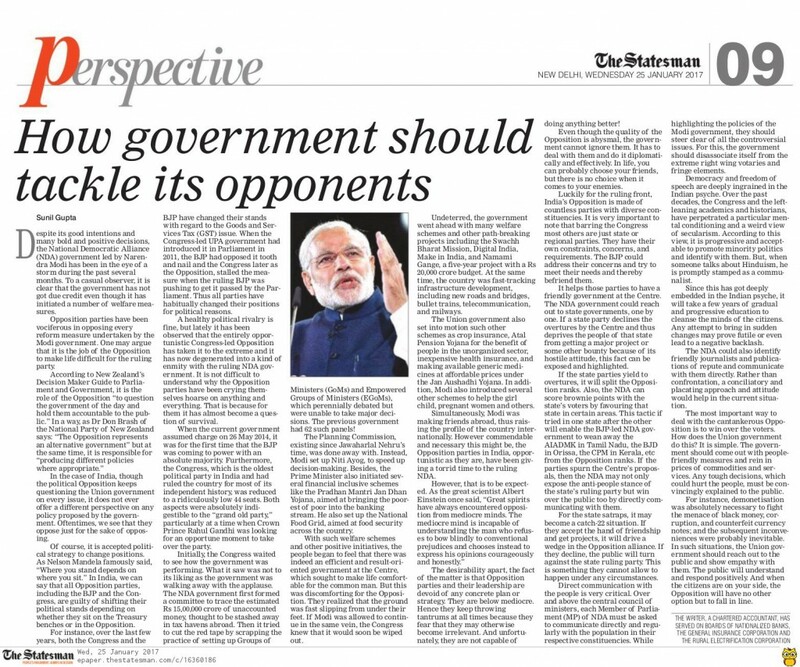 How Government Should Tackle Its Opponents? Despite its good intentions and many bold and positive decisions, the National Democratic Alliance (NDA) government led by Narendra Modi has been in the eye of a storm during the past several months. To a casual observer, it is clear that the government has not got its due credit even though it has initiated a number of welfare and forward-looking measures. The Opposition parties have been vociferous in opposing each and every reform measure undertaken by the Modi government. One may probably argue that it is the job of the Opposition to make life difficult for the ruling party. In the case of India, though the political Opposition keeps questioning the Union government on each and every issue, it does not ever offer a different perspective on any policy proposed by the government. Oftentimes, we see that they oppose just for the sake of opposing. Of course, it is an accepted political strategy to change positions. As Nelson Mandela famously said, “Where you stand depends on where you sit.” In India, we can say that all Opposition parties, including the BJP and the Congress, are guilty of shifting their political stands depending on whether they sit on the Treasury benches or in the Opposition. For instance, over the last few years, both the Congress and the BJP have changed their respective stands with regard to the Goods and Services Tax (GST) issue. When the Congress-led UPA government had introduced it in Parliament in 2011, the BJP had opposed it tooth and nail and the Congress, later, as the Opposition, stalled the same when the ruling BJP was pushing to get it passed by the Parliament. Thus, all parties have habitually changed their positions for political reasons. A healthy political rivalry is fine, but lately, it has been observed that the entirely opportunistic Congress-led Opposition has taken it to the extreme and it has now degenerated into a kind of enmity with the ruling NDA government. It is not difficult to understand why the Opposition parties have been crying themselves hoarse on anything and everything. That is because for them now it has almost become a question of their survival. When the current Union government assumed charge on May 26, 2014, it was for the first time that the BJP was coming to power with an absolute majority. Furthermore, the Congress, which is the oldest political party in India and had ruled the country for most of its independent history, was reduced to a ridiculously low 44 seats. Both aspects were absolutely indigestible to the “grand old party,” particularly at a time when Crown Prince Rahul Gandhi, was looking for an opportune moment to take over the party. Initially, the Congress waited to see how the government was performing. What it saw was not to its liking as the Central government was walking away with the applause. The NDA government first formed a committee to trace out the estimated Rs 15,00,000 crore of unaccounted money, thought to be stashed away in tax havens abroad. Then it tried to cut the red tape by scrapping the practice of setting up Groups of Ministers (GoMs) and Empowered Groups of Ministers (EGoMs), which perennially debated but was unable to take any major decisions. The previous government had 62 such panels! The Planning Commission, existing since Jawaharlal Nehru’s time, was done away with. Instead, Modi set up Niti Ayog, to speed up decision-making. Besides, the Prime Minister also initiated several financial inclusive schemes like the Pradhan Mantri Jan Dhan Yojana, aimed at bringing the poorest of poor into the banking stream. He also set up the National Food Grid, aimed at food security across the country. With such welfare schemes and other positive initiatives, the people began to feel that there was indeed an efficient and result-oriented government at the centre, which seeks to make life comfortable for the common man. But this was discomforting for the Opposition. They realized that the ground was fast slipping from under their feet. If Modi was allowed to continue in the same vein, the Congress knew that it would soon be wiped out totally. Undeterred, the government went ahead with many welfare schemes and other path-breaking projects including the Swachh Bharat Mission, Digital India, Make in India, and Namami Gange, a five-year project with a Rs 20,000 crore budget. At the same time, the country was making rapid strides in fast-tracking infrastructure development, including new roads and bridges, bullet trains, telecommunication, and railways. The Union government also set into motion such other schemes as crop insurance, Atal Pension Yojana for the benefit of people in the unorganized sector, inexpensive health insurance, and making available generic medicines at affordable prices under the Jan Aushadhi Yojana. In addition, Modi also introduced several other schemes to help the girl child, pregnant women and others. Simultaneously, Modi was making friends abroad, thus raising the profile of the country internationally. However commendable and necessary this might be, the Opposition parties in India, opportunistic as they are, have been giving a torrid time to the ruling NDA. The desirability apart, the fact of the matter is that the current Opposition parties and their leadership in India are devoid of any concrete plan or strategy. They are below mediocre. Hence they keep throwing tantrums at all times because they fear that they may otherwise become irrelevant. And unfortunately, they are not capable of doing anything better! Even though the quality of the Opposition is abysmal, the government cannot ignore them. It has to deal with them and do it diplomatically and effectively. In life, you can probably choose your friends, but there is no choice when it comes to choosing your enemies. Luckily for the ruling front, India’s Opposition is made of countless parties with diverse constituencies. It is very important to note that barring the Congress most others are just state or regional parties ruling in one state or another. They have their own constraints, concerns, and requirements. The BJP could address their concerns and try to meet their needs and thereby befriend them. It helps those parties to have a friendly government at the Centre. The NDA government could reach out to the state government, one by one. If a state party declines the overtures by the Centre and thus deprives the people of that state from getting a major project or some other bounty because of its hostile attitude, this fact can be exposed and highlighted. If the state parties yield to the overtures, it will split the Opposition rank. Also, the NDA can score brownie points with the state’s voters by favouring that state in certain areas. This tactic if tried in one state after the other will enable the BJP-led NDA government to wean away the AIADMK in Tamil Nadu, the BJD in Orissa, the CPM in Kerala, etc from the Opposition ranks. If the parties spurn the Centre’s proposals, then the NDA may not only expose the anti-people stance of the state’s ruling party but win over the public too by directly communicating with them. For the state satraps, it may become a catch-22 situation. If they accept the hand of friendship and get projects, it will drive a wedge in the Opposition alliance. If they decline, the public will turn against the state ruling party. This is something the latter cannot allow to happen under any circumstances. Direct communication with the people is very critical. Over and above the central council of ministers, each Member of Parliament (MP) of NDA must be asked to communicate directly and regularly with the population in their respective constituencies. While highlighting the actual policies of the Modi government, they should steer clear of all the controversial issues. For this, the government should disassociate itself from the extreme right wing votaries and fringe elements. Democracy and freedom of speech are deeply ingrained in the Indian psyche. Over the past decades, the Congress and the left-leaning academics and historians, have perpetrated a particular mental conditioning, and a weird view of secularism. According to this view, it is progressive and acceptable to promote minority politics and identify with them. But, when someone talks about Hinduism, he is promptly stamped as a communalist. Since this has got deeply embedded in the Indian psyche, it will take a few years of gradual and progressive education to cleanse the minds of the citizens. Any attempt to bring in sudden changes may prove futile or even lead to a negative backlash. The NDA could also identify friendly journalists and publications of repute and communicate with them directly. Rather than confrontation, a conciliatory and placating approach and attitude would help in the current situation. The most important way to deal with the cantankerous Opposition is to win over the voters. How does the Union government do this? It is simple. The government should come out with people-friendly measures and rein in prices of commodities and services. Any tough decisions, which could hurt the people, must be convincingly explained to the public. For instance, demonetization was absolutely necessary to fight the menace of black money, corruption, and counterfeit currency notes; and the subsequent inconveniences were probably inevitable. In such situations, the Union government should reach out to the public and show empathy with them. The public will understand and respond positively. And when the citizens are on your side, the Opposition will have no other option but to fall in line. This entry was posted in blog on January 25, 2017 by admin. Well, its an irony that BJP is getting back its own medicine. They also never presented proper solutions while in opposition. In fact they are repackaging UPA schemes and program with lot more marketing and advertisement. Good intentions, well, many of us felt Delhi CM also had great intentions. I do agree that this government started with great force but off late (1+ years) its just behaving as it is just focusing on various state elections. They have lost the plot big time and I feel it will reflect in the State and later in General Elections. Via giving them a Chance as well….!! Bangladesh border problem was the oldest issue in addition to Pakistan even this problem is resolved and marketing and advertising globally only can fetch growth for us in terms of investments and technological developments, the efforts to do this are not small. The image that India has built globally is forcing other developed countries to support India in many international forums. A very educative and enlightening article. The simple and sincere approach is indeed very genuine. Thank you Sir! I would be looking forward to your write-ups. Best wishes. Indian opposition party do not play any responsible role in the true sense. To some extent voter are responsible for this as they can’t judge between the good and bad steps taken by Govt. The demonetization is a healthy move for the Indian economy at large, but there is lots of anti campaign and demotivation. It will take ages to come up… thanks to PM Modi Who had the courage, willingness and vison to take bold and unpopular step. VERY SIMPLY BY ANNOUNCING POLITICAL GIFTS NON EVER ANY ONE IN THE PAST NATIONAL ELECTIONS. I dont see any fruit full steps taken by the current government to ease the burden. At least the common man, poor and farmer has not benefited. Day to expenses have increased multi fold over the past 2 years. So according to me this is more of a corporate and biased information which has been presented. No Independent analysis was done by the author excepting mentioning misdeeds of BJP on GST when they were in opposition. Many renowned economist had commented that Black money in cash in Indian Economy is about 300 to 400 crore. By demonetisation you can weed out this. But you can notweed out FERA violation Underinvoicing, Tax frauding and defrauding bank not repaying the loan taken. He did not mention anything on these areas. The people of India are very much hurt with Demonitisation. The people wants promise made during election 1st to be fulfilled. Polarisation must stop. India may be the only country in world that has so many prominent political players. This vastness has disturbed decision making and timely passage of legislations. People are watching closely what Congress and other opposition parties are trying to do. They are disrupting the parliament every now and then without good reasons hence they will be punished in polls. It is right to say that while Modi tried to reach out to people through Mann Ki Baat, there is no attempt to reach out to opposition. May be because they have absolute majority. Should we not invoke Atal ji in this. He was a true statesman who made the parliament laugh, applaud and listen. Narendra Modi should try something of that sort. Now that details have come out, demonetisation did not bring out any black money. BJP totally failed in this respect and the PM must resign from his post on moral grounds. The work of opposition is to raise serious issues and flaws in policy making. The irony is that while they are raising issues, they are neither serious nor error on part of the government. 2017 elections in 5 polls will tell if the public has any backing for demonetisation. If the BJP comes with clear majority in UP then opposition parties will stop hindering their work. When someone is adamant to bring you down, no matter how much you them, they will still condemn your actions, and that’s true with opposition leaders of our country. Ultimately it’s the public that is losing. We cannot blame opposition alone or ruling party alone, they become the same when they occupy treasury or non-treasury seats. Even BJP did not let Parliament function. Congress has now brought in Navjot Sidhu in Punjab and they are allying with SP in UP. This only means that there is no ideology in Indian politics, its is all about winning elections.